A prestigious institution today announced that two remarkable bridges in Warrington have been nominated for a newly-established Heritage Award (1) – the 100-year-old Transporter Bridge and the even older Woolston Eyes Footbridge (pictured) (2). The Institution of Civil Engineers North West has introduced the new award this year to celebrate historic civil engineering features that people and communities know and love. The new award will complement the Institution’s annual awards which are already held to showcase the best of the region’s new civil engineering work. The famous Warrington Transporter Bridge, which will be 100 years old later this year, has a fascinating history, from transporting cement rail wagons, workers and trucks to being used as a fire watching post during the Second World War. It is said to be the only rail transporter bridge amongst eight transporter bridges left in the world. It is Grade 2* listed on English Heritage’s At Risk Register. 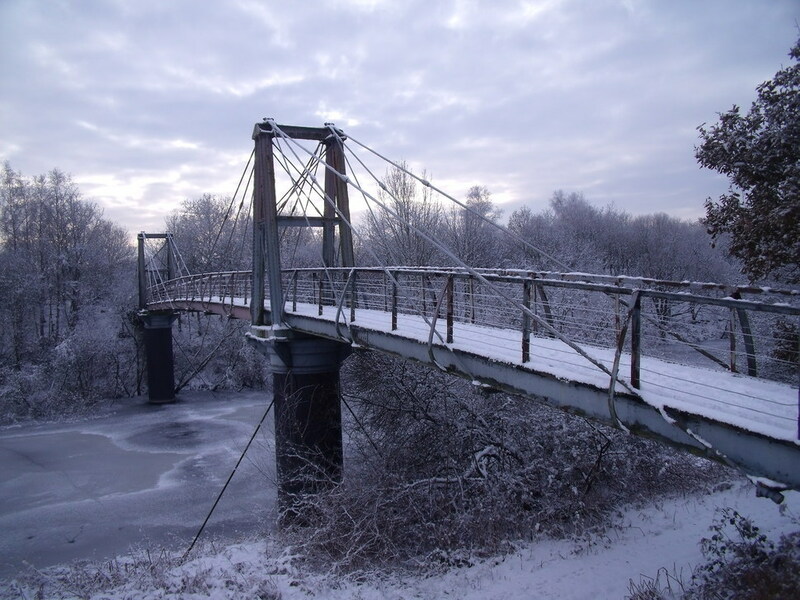 A less well known Warrington bridge has also been nominated for the award: the Woolston Eyes footbridge at Thelwall Lane, which has been described as an extremely important example of Victorian civil engineering. Brian Duguid, a Fellow of the Institution of Civil Engineers, said today: “Woolston Eyes Footbridge is built of wrought-iron trestles on cast-iron cylinder supports, and it’s believed to be the oldest surviving unaltered cable-stayed bridge anywhere in England. Darrell Matthews, North West Regional Director of the Institution of Civil Engineers, said: “Last year’s North West Civil Engineering Awards were dominated by Warrington-based companies, which is an indicator of the town’s growing importance to the region. This year we’ve introduced our Heritage Award, and it’s great to see that local people have put forward local civil engineering landmarks, which shows pride in Warrington’s civil engineering heritage. To qualify for a Heritage Award, the work of civil engineering – which could include any infrastructure relating to transport, energy, water and sewerage, waste management, flood defences or structures such as stadiums, piers, bridges or similar – had to be at least 70 years old. Judging will take place in January and the winners will be announced during a special Awards Dinner, which this year will be held at the prestigious Halston Hotel in Carlisle, in the presence of Sir John Armitt, President of the Institution of Civil Engineers. For further information please contact Spencer Fitz-Gibbon, ICE North West External Relations Executive, 07825 383880, spencer.fitz-gibbon@ice.org.uk. The Institution of Civil Engineers already holds its Civil Engineering Awards every year, to recognise the skill and innovation that go into new civil engineering works and the benefits they bring to society – last year’s North West winners included a community hydro-power scheme in Oldham, a reservoir improvement in Burnley and a world-leading water-treatment works in Trafford. The Woolston Eyes Footbridge, credit Mott MacDonald. While any member of the public may make a nomination, nobody who has made a nomination will be involved in the judging process, and ICE employees and their close relatives are not eligible to make nominations. Any organisation which has an address in the region may make a nomination – whether it owns the nominated property in question or not – but ICE and its component parts (branches, committees etc) will not make nominations, although individual members may. The Institution of Civil Engineers (ICE) was founded in 1818 to ensure professionalism in civil engineering. It represents 80,000 qualified and student civil engineers across the UK and around the globe. The ICE works with the government of the day to help it achieve its objectives, while working with industry to ensure construction and civil engineering remain major contributors to the UK domestic and export economies. "This year weve introduced our Heritage Award, and its great to see that local people have put forward local civil engineering landmarks, which shows pride in local civil engineering heritage."